As the former chief executive of FTSE 100 firms Rentokil and Unilever’s China and Taiwan operations, Alan Brown is more than familiar with challenges. In fact, he claims to thrive on them. But when he came in as the head of global oilfield services company Asco at the height of the downturn he faced a fresh round of tests – bringing the private equity backed business up to speed as the market sought to stabilise in a lower for longer price environment. When Mr Brown’s appointment was made in December 2014 the oil price had already dipped 40% below the highs of June that year. So the first gauntlet was thrown down pretty quickly – weather the storm while others die. One of the first things Mr Brown tells me at the company’s Peterhead base was how he was “amazed” at the inefficiency of the oil and gas industry. This remains high on his list of priorities – like many survivors of the downturn, cutting costs and making savings is of paramount importance even now as experts claim green shoots of growth are finally appearing after a tough few years. But with more than a few years of experience under his belt, his plan is finally starting to pay off. He said: “I came from the consumer goods industry. “I am not from oil and gas and have only been in the industry three years but I have been pretty amazed by how inefficient oil and gas is. “Trying to get the whole industry up to speed means there is a huge opportunity for Asco in particular. “I like a challenge – that’s what I am about. I like changing things, that’s what I am about. I have always been involved in change-arounds, that’s what I do. Unilever China was a massive turnaround, Rentokil was a turnaround. I like a challenge. “Asco seems to me to be an interesting turnaround. I like doing new things. So the idea of doing a turnaround in oil and gas in private equity was rather exciting. And despite his involvement with some of the world’s biggest companies over his career, Mr Brown is still very much a visible leader – keen to learn and lead from example. We chat in the canteen, the workers around the base know exactly who he is, he spent a weekend on a vessel to deliver cargo and then on his return to shore blogged about his first-hand experience. Mr Brown is not the sort to lead from behind. He knows the base and its potential but he also knows what needs to be done to thrive. He said: “One of the best things I did was spend a long weekend on a vessel and going out with the crew – it was just great insight. “I want to get out there to see these amazing structures. I think the oil and gas industry is like these muscle men you see in the gym. Massively overdeveloped in some places but yet underdeveloped in others. “It’s really interesting and the engineering is fabulous. The things they have achieved is absolutely fabulous. “Some of the basic stuff there is a lot the oil and gas industry can learn from other industries. And with that mantra the conversation shifts to exactly where Asco is now and what the future holds for the firm. Mr Brown said the impact on oil has been “much more” about margins than volume. And he hopes that recent signs of market stabilisation will continue, although he admits some places, like Aberdeen, are still facing “difficulties”. But the reinvention of the North Sea following the price plunge is not all dark clouds – there are silver linings to be seen with a swathe of new players – and new contracts to win. He said: “I see a lot of the operators coming in – Apache, Nexen, etc, who are investing. “They have found a way to extract more oil from existing reservoirs. But in order to progress, so too does the technology and the mindset of his staff. A sign on the wall of the South Base in Peterhead, as you enter the premises states “The most dangerous phrase in the English language is ‘but we have always done it that way”. Under previous leadership Asco grew from a UK North Sea focused business to one with an international footprint, with operations in North America, the Middle East, Africa and Australia. And now the chief executive is planning his next move – adding value to operations. He said: “There is a huge move towards digitalisation and the thought of doing something new is exciting and it’s starting to permeate through. The challenge that I have as a leader is trying to get the organisation excited about these changes and not frightened by them. “We also have to add value and we are doing that with materials management. “We also have a big opportunity with marine. I believe that the whole optimization of the marine side has got a long way to go. I always describe the North Sea side as operating a taxi service between the operators and that’s not an efficient way to move. Another silver lining for both Asco and Peterhead is what the revival of North Sea fortunes means for the town, Mr Brown tells me. He said: “Attracting talent to the town is not straightforward but the business has become a lot sexier in the last 18 months. Asco currently employs 1,500 with around 475 in Peterhead – about 200 on site at any one time. 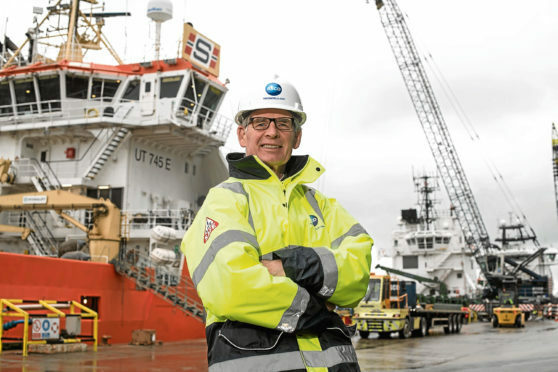 “I think Peterhead is also starting to be recognised as the gateway to the north North Sea with all the developments taking place West of Shetland, which is great for us as we are that bit closer to where the development is taking place. “Scrabster is also well located but the clustering of the oil and gas industry is here, it’s not there.